Cook bacon until done and set aside on a paper towel to absorb excess bacon fat. Generously butter one side only of each piece of bread and sprinkle Ring of Fire ® All Purpose Seasoning on the buttered side. (Note: The richness of this sandwich overtakes most of the heat so don't be afraid to use a lot of the seasoning.) Cut the green apple in half, remove core and slice it into approximately 1/4" thick slices. Cut the Tomato into 1/4" slices and set aside. In a skillet or sauté pan, place the buttered and seasoned bread (no cheese), butter side down on medium-low heat, and cook until golden brown. Once the bread is toasted, assemble the sandwich with one slice of each cheese on the bottom, then bacon, tomato and green apple. Finish with one slice of each cheese, then top with bread. Place the completed sandwich in the microwave for approximately 45 seconds to 1 minute depending upon your microwave wattage, until the cheese is melted. (This is by far the fastest and cleanest way to make this delicious and very mature classic.) Makes 2 servings. Cooking Tip: Unlike the normal grilled cheese sandwiches we've all grown up with, this one has too much stuff in it to be cooked the usual way. The bread will burn before the cheese melts so cooking the bread separately and finishing in the microwave will give the best results. Cook bacon until done and set aside on a paper towel to absorb excess bacon fat. Generously butter one side only of each piece of bread and sprinkle Ring of Fire ® All Purpose Seasoning on the buttered side. (Note: The richness of this sandwich overtakes most of the heat so don't be afraid to use a lot of the seasoning.) Cut the green apple in half, remove core and slice it into approximately 1/4" thick slices. Cut the Tomato into 1/4" slices and set aside. 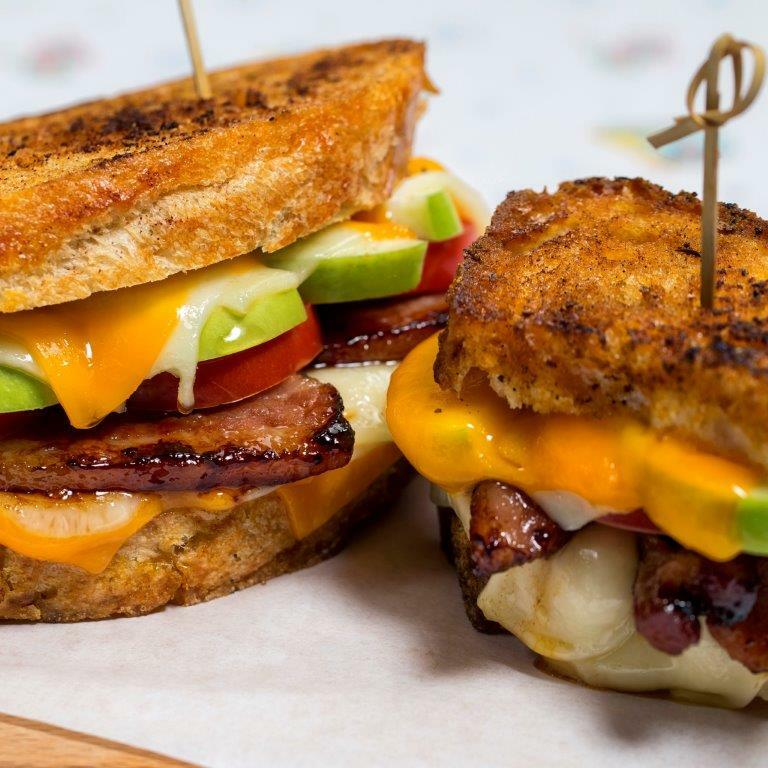 Unlike the normal grilled cheese sandwiches we've all grown up with, this one has too much stuff in it to be cooked the usual way. The bread will burn before the cheese melts so cooking the bread separately and finishing in the microwave will give the best results.